We are an eminent organization functioning as 3 Neck Glass Flask Manufacturer, Exporter and Supplier from Pondicherry, India. We have a well-developed infrastructure to manufacture Glass Flasks in various sizes and shapes. We can even customize the flasks according to specific details mentioned by the buyers. Buyers from over the country and overseas can place bulk orders for our 3 Neck Glass Flasks. Round-bottom flasks are types of flasks having spherical bottoms used as laboratory glassware, mostly for chemical or biochemical work. They are typically made of glass and in modern days, they are usually made of heat-resistant borosilicate glass. There is at least one tubular section known as the neck with an opening at the tip. Two or three-necked flasks are common as well. 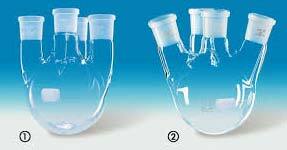 Round bottom flasks come in many sizes from 5 mL to 2 L.